Stephanie Thornton became a favorite of mine with The Secret History: A Novel of Empress Theodora and The Tiger Queens: The Women of Genghis Khan. She writes about lesser known women of history - those that were close to the action, whether wife, lover or daughter of someone famous. The Conqueror's Wife is no exception. This is a time period I have never read before and knew next to nothing of Alexander the Great. With that amount of knowledge it is always great to hunker down with no preconceived ideas of what to expect and can enjoy the ride. Again Stephanie Thornton did not disappoint, she has that wonderful ability to breath life into her characters. Each one of them with unique personalities and traits, it's through them that we get a clear picture of Alexander. Alexander was a great man in his time, but it was through the women in his life that helped shape who he was. With his half-sister, Thessalonike (determined and ready for action), Drypetis (warrior) or Roxana, (his beautiful queen) alternatively telling their story that we see who Alexander the Great was. There is also his male friend Hephaestation that rounds out the narrative. This isn't a small book, coming in at almost 500 pages leaving plenty of time for the strong character development here as well as depth to the story. Even with these 4 narratives the story flowed along nice and smooth, Thornton's historical detail shows her knowledge of this time period, it wasn't hard to visualize so much that was taking place, it was easy to get lost in the pages. 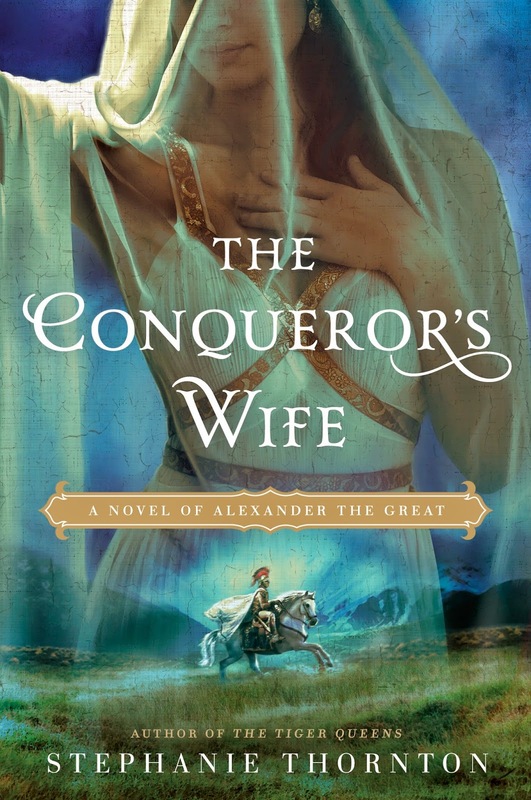 I highly recommend The Conqueror's Wife to lovers of HF, especially those that crave strong lesser known women. Be sure to read the prologue below and entry for a chance to win a copy of this wonderful book. Alexander deemed himself a god, the mythic descendant of Achilles and the son of Zeus, and entire nations fell to their knees in ecstatic worship of him. But he was no god any more than we were nymphs and dryads, benevolent four-hoofed centaurs or vengeful three-headed chimeras. He called himself Alexander the Great and claimed that he conquered the world. But he would have been lucky to conquer a stinking midden heap populated by swarms of biting flies had it not been for our cunning and daring. Alexander founded cities of culture and learning, and named them after himself in a fit of hubris. But he razed more cities than there are stars in the sky, slaughtered their men, and burned their ancient palaces so that the four winds carried the gray ashes to rain down upon lands more distant than Alexandria-the-Farthest. He claimed that the earth trembled, mountains quivered, and oceans overflowed their shores at his approach, but without us, Alexander would never have mounted a single golden throne or worn the coveted eagle diadem of Persia, much less the combined crowns of Greece, Egypt, and India. Like Achilles, he sought glory and everlasting fame, and beseeched the gods that his name would echo throughout history. Yet so many of his baser deeds have been forgotten, or retold to forge him into a hero worthy of epic ballads. It was because of him, and for him, that we did great, and also terrible, things. Just as Zeus sat in his throne room atop Olympus, surrounded by the gods of violence and light, the goddesses of desire and the hearth, so too was Alexander surrounded by us. We were murderers and poisoners, innocents and warriors. And without us, Alexander would have been only a man. Instead, he was a god. – Giveaway is open to US addresses . Great review. I haven't read anything by this author before but you have intrigued me. She sounds similar to Michelle Moran in that she focuses on strong women in history. Love that! I love Stephanie Thornton. She is one of my favorite authors. I'm currently reading The Sisters of Versailles by Sally Christie.